Wedding planning is a design-heavy process. Whether it’s tablescapes, bouquets, invitations, lighting, or attire, many couples spend a lot of time designing their weddings. Despite all of this designing energy, there is a design opportunity that many couples miss while planning their weddings — and that is the wedding registry. When it comes to the registry, the considerations are endless – which items to include, how many retailers to choose from, should all items be available for online purchasing, what price points should items be in, what do you actually need, the list goes on and on. In this sea of decision making, many couples miss the opportunity to use their registry to design their life together and curate their registry with an aesthetic and story-telling eye. I believe that a registry is not just a list of stuff — it’s a list of the tools you’ll use to build your lives together. Your guests don’t just want to buy you a gift — they want to invest in your future. So, I would encourage you to approach your wedding registry with an eye for design. Not sure how to get started? Read on. I would recommend beginning the process of registering for gifts early in the planning process. Especially if you’re throwing an engagement party, you’ll want to have a small list of gifts registered for for those guests who may inquire. If you are not throwing an engagement party, I would recommend having your registry set up by 6 months in advance of your wedding. As a general rule of thumb, I recommend registering for about 1.25-1.5 gifts per guest. For example, for a guest list of 150 people, I would recommend having between 180 and 225 gifts on your registry. Some guests will opt to give cash or monetary gifts, but when you factor in other events like wedding showers and engagement parties, you’re likely to get a good amount of the registered-for items covered while still leaving guests a good amount of options to choose from. Choose at least one budget-friendly retailer, like Target, Bed Bath + Beyond, or Amazon. These retailers are great for some of the basic and affordable items for your registry, like kitchen tools and some appliances. Choose one mid-range or higher-end retailer, like Crate + Barrel, West Elm, Anthropologie, etc. These retailers are good for some of the higher-end items or items you’ll use more regularly, like dishes, glassware and some other unique or decorative items. Choose at least one retailer where guests can buy gifts in person. It can be tempting to opt for all-online options, but some guests prefer to go to a physical store to purchase a gift, so make sure there is at least one option available for those guests. If what you are primarily in need of is cash, I recommend using a website registry where you can designate what guests’ funds are going towards (like Zola, Honeyfund or Newlywish). In general, I usually recommend that couples choose one budget-friendly retailer, one mid to high-end retailer, and one retailer that is geared towards something more unique, like a cash registry or a camping registry with REI, a wine registry, or something along those lines. If possible, try to provide a good amount of gift options in each of these categories. You may find that you have a larger amount of items in the $0-50 range, since there are a good amount items you may need that are smaller. That’s OK — some guests will give you more than one gift in that category. A note on the $200+ category — don’t be afraid to put some more expensive items on your registry, like furniture, for example. Some guests may go in on a larger gift together, and some retailers, like Crate and Barrel, will offer discounts on unfulfilled registry items following the wedding. When you get that scanner in your hand at a store or a mouse in your hand in front of your computer, it can be really tempting to put all sorts of things on your registry without giving it any thought. But that could lead to you overwhelming your registry with items that you don’t really want or need. I recommend going through a thorough checklist of potential wedding items, marking the items you are interested in, and then prioritizing those items. From there, you can be sure to add (and likely get) the items that mean the most to you to your registry, rather than items that are only mildly of interest to you. To get you started, I’m offering my Complete Registry Item Checklist for free! Like I said before, your registry is not just a list of stuff — it’s a list of tools you’ll use to build your future life. The best way to ensure that the items you place on your registry will last for years in your home and your heart is to choose items that speak to you both in style and function. When I design a registry, I take special care to ensure that the items not only go together, but also fit the couple’s everyday living style. For example, for a couple that lives in a sleek, monochromatic space, I might suggest minimal dishes and ultra-modern flatware. For a couple that lives in bright and eclectic environment, the choices would be different. Moodboards are a great way to test items together, especially when they come from different retailers. 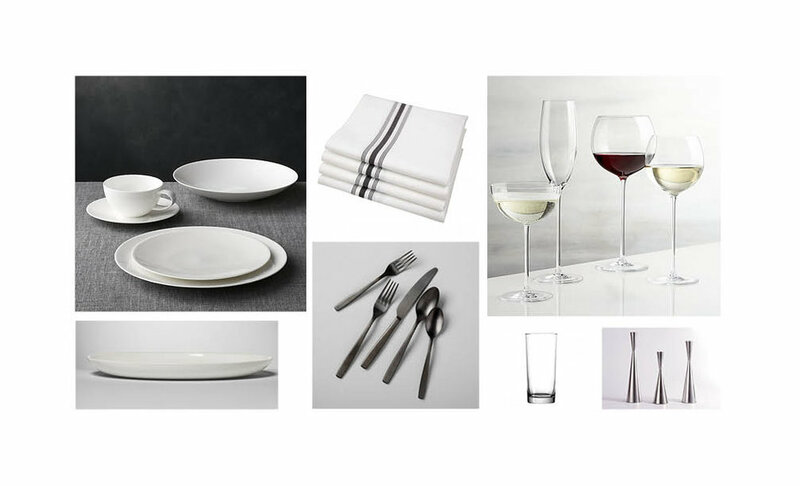 Below is a moodboard I created for a modern couple looking for classic, modern supplies for a dinner party with items sourced from Crate + Barrel, Target and Amazon. Interested in learning more about my Registry Design offerings? Get in touch! Because weddings are a lot of work, many couples treat their Registry like a task they can cross off their list. While this is true to an extent, I recommend revisiting your registry over time. Many couples have at least one wedding shower prior to the wedding where guests primarily give gifts from the registry. If you are having one (or two or more), use these events to your advantage! Once you know the date of the shower(s), set up your registry with some (but not all – maybe 50-75%) of your top-priority items. Limiting the offerings before each shower ensures that you’ll get more of the items you really want. After each shower, add more of the items on your top-priority list, and supplement with your next level of interest items as needed. Write thank you notes in a timely fashion — etiquette dictates that after a wedding, thank you notes should be out within three months. In my opinion, the earlier the better. Once again, here is the link to get my Registry Checklist for yourself. If you are interested in learning more about my Registry Design services, get in touch! I’d love to help you create a well-curated registry. What’s In my Bag? My Wedding Day Emergency Kit Revealed!